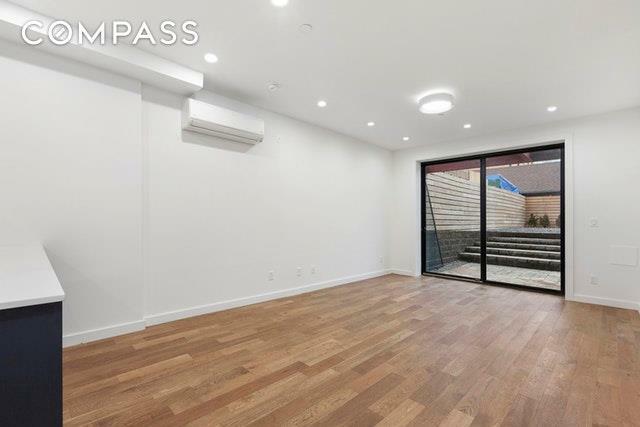 Located in the heart of Greenpoint, 171 Green Street is an inspiring, newly developed condominium building featuring elegant boutique apartments. 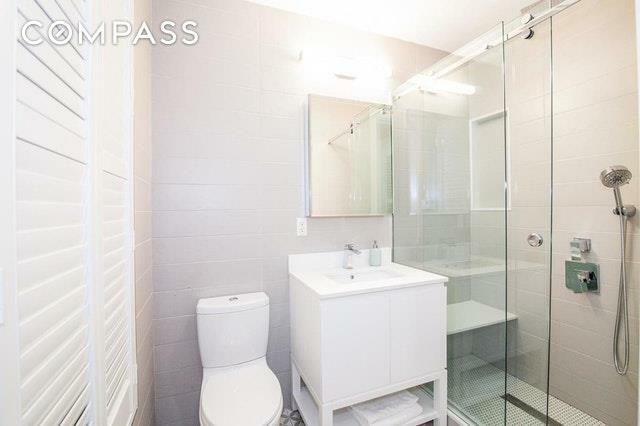 Apartment 1A is a spacious 2 bedroom, 2 bathroom apartment boasting an open floor plan design and over 1,000 square feet. This ensures the kitchen, dining, and living spaces are used to their maximum potential. With fine finishing, abundant lighting, and stunning hardwood flooring throughout, Apartment 1A is a true gem.The modern and thoughtfully designed kitchen is equipped with stainless steel Bosch appliances, including a dishwasher, oven, cooktop, microwave, and four door refrigerator. The oversized kitchen also has ample storage and pantry space throughout. The breakfast bar is spacious and easily able to accommodate three or four bar stools. The welcoming living space is open and always filled with ample light from the floor to ceiling windows/sliding doors. There is more than enough space to separate the living and dining areas. The rear of the living area offers floor to ceiling sliding glass doors, opening onto the enormous private yard. Boasting over 1,200 sq ft of private outdoor space, this backyard is the perfect place for entertaining, barbecuing, or simply sunbathing on a summer day!The beautiful master bedroom features a large walk-in closet / dressing area, as well as an en-suite bathroom. The second bedroom is also spacious and has its own closet. The large bedroom can easily fit a king sized bed. Oversized windows in both bedrooms ensure that the rooms are always filled with natural light. 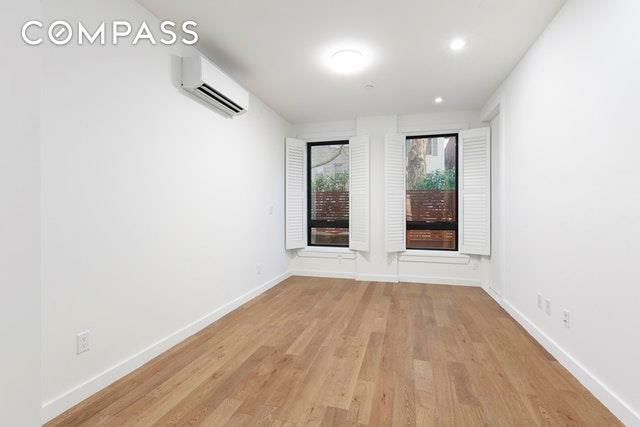 Lastly, the apartment benefits from an in unit washer dryer, located in the convenient laundry space.Proximity to the G and 7 train make navigating the city an easy task. 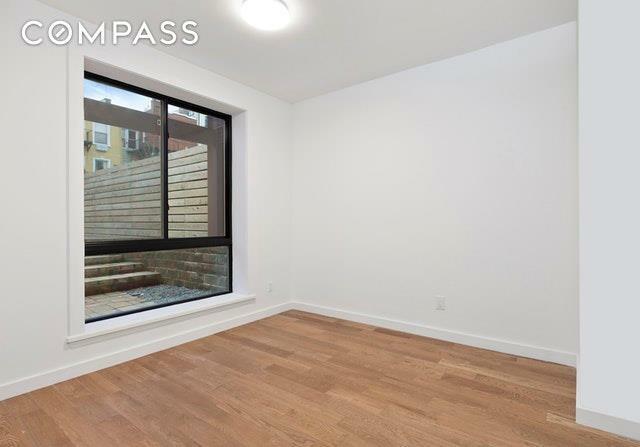 Located just a short walk from Manhattan Ave, great restaurants, bars, and coffee shops wont be hard to find!